March brought some more snow to our happy forest. And then the weather turned warmer and the snow is slowly melting. In March the sky is often deep, pure, and very clear, with cold but sunny days that lure us outdoors, awaken the various animals, and bring an influx of birds. Now that winter retreat has ended and our doors are open once again, please come visit! Enjoy Abbey life photos here. Each year the Abbey opens one month of our multi-month winter retreat to guests, and this year nine people joined us. They were one of the best groups we’ve had so far: very cooperative and kind. They kept silence well and pitched in to help. 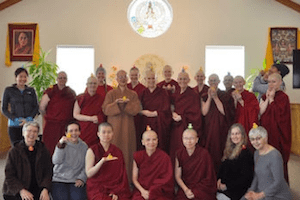 The one-month Amitabha retreat with the guests concluded in mid-March with a Dorje Khadro fire puja to burn up all our negativities and a go-around where people shared their experiences. See the end of retreat photos here. 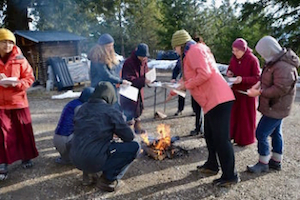 The Abbey community remained in retreat until the very end of March, finishing with a fire puja and the ceremonies to end varsa—our three-month monastic retreat. We’ll tell you about these activities in the next enews. Until then, you can see the photos showing how the community’s fire puja was a meditation on emptiness. April 8 will be our first Sharing the Dharma Day after retreat. We’ve missed seeing our friends over the winter, so we hope to see you—and new visitors too! 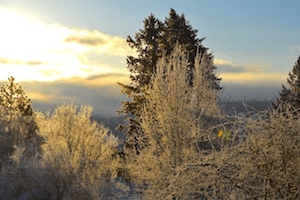 —for the meditation, Dharma talk, potluck, and puja. Having time to do retreat and delve into Dharma practice and integrate the Dharma with our minds is a rare opportunity in today’s busy world. Nine guests joined the Abbey community for the first month of the retreat. Here’s a sampling of their reflections. You can really see how beneficial doing retreat is. 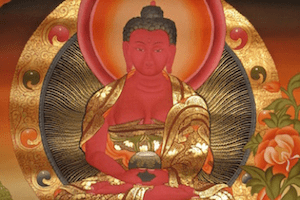 Read each person’s full report in these Amitabha Retreat Reflections. See portraits of the winter retreatants here. Angela Yang: With the combination of 100+ meditation sessions and Venerable Chodron’s kind guidance, I learned to change my habit pattern from pushing myself too much to being more compassionate and relaxed in my meditation practice. Sravasti Abbey was by far the most beautiful place that I’ve done a retreat at, and this really was the perfect pure land for my retreat. Jazz: With hands folded in respect and a heart-mind made (hopefully) somewhat wiser, thanks to all you’ve done through your collective open arms. I bow down and sing praise for the kindness of the spiritual community that calls this Western pure land of Sravasti Abbey their home. May the Dharma in the West and in my heart flourish. Jane Robson: I was able to see the patterns through which I react and make decisions. Noble silence provided a way to hear my own thinking, as did the abundant life surrounding the Abbey, with the constant clucking of wild turkeys and the near-silent tread of deer. Thank you, all. 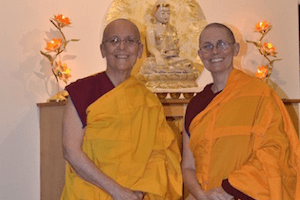 Karen Barrick: Venerable Chodron said in the beginning of retreat, “You can’t clean the dirt you can’t see. Find the dirt.” This raised various responses for me: I need to find my dirt and deal with it head-on. Do I want to continue living in a way where I create more dirt? This retreat helped me look, as Ven. Chodron said, “What kind of person do you want to be?” The choice is mine —create more dirt with grasping, self-centeredness and greed/attachment or be open, loving, compassionate, and generous. 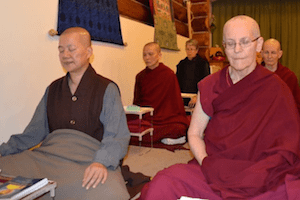 Venerable Thubten Nyima: I focused on understanding what self-respect means, on identifying when and how I behave in ways that are not in line with self-respect, and on practicing letting go of those old habits. I realized that respecting myself is more important than earning others’ respect. Self-respect is a strong foundation for the path as it helps me keep my precepts, act in ways that are consistent with my values, and gives me impetus to develop my good qualities. Sabrina Facco: I feel a very strong connection with Amitabha. Before my father passed away I talked to him about Amitabha and the Pure Land, so I was curious to know more about it. I feel much more at peace and relaxed, and I can say that Amitabha’s company has been really inspiring. He always looks at me with much love and acceptance, and I learned that all the other stuff was just made up by my mind. We are delighted that 175 people are finishing up the Retreat from Afar with us this year. Of these, 85 are prison inmates who are practicing in very difficult situations, some in dorm rooms with 300 others who are talking, watching TV, etc. ; others in solitary confinement with clanking doors and shouting all around them. We respect and appreciate all of these people joining us in doing retreat. Vens. Semkye and Chonyi joined a diverse group of about 150 for the International Women’s Day celebration at the Spokane Women’s Club. The theme of the event was “Let Your Voice Be Heard,” an invitation to art and advocacy through sharing life stories. Ven. Chonyi introduced the keynote speaker, Sandra Williams—journalist, filmmaker, and story teller—who kept the audience’s rapt attention with her personal tales as an activist and creator of Black Lens, Spokane’s black newspaper. Sandy concluded with an impassioned request for all of us to develop close relationships with and speak up for people that are marginalized due to sexual orientation, gender, race, religion or political views. Later on, Ven. Chonyi guided a breathing meditation to settle the body and mind, and Ven. Semkye led a meditation on the kindness of others, focusing on how our life stories are not just about ourselves but about others and how we are the beneficiary of incredible kindness that makes the journey possible. Many people thanked the nuns for their contribution to a rich day of learning. The snow began to fall the night before the march and by late morning the next day, there was a good six inches if not more covering the ground. 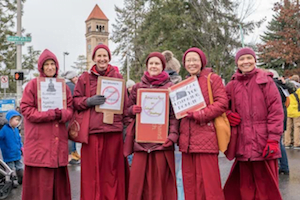 Yet five Abbey nuns were determined to get to the march in Spokane, so off we went. Ven. Tarpa had to plow all of Country Lane so we could get down the hill, and once on Spring Valley Road, the going wasn’t much easier. But we made it there and joined about 5,000 others in the March for Our Lives in Spokane. See our photos of the Spokane march here. Normally we won’t leave the Abbey during retreat, but the issue of gun violence and the trauma and tragedy it is causing not only in schools but also in communities across the country is close to our hearts. We are proud of the teens who are speaking up on behalf of a nonpartisan issue that is a public health concern. We wish them well as they heal from their horrifying experiences that no one—child or adult—should have to go through. Our 2017 Annual Report is out! 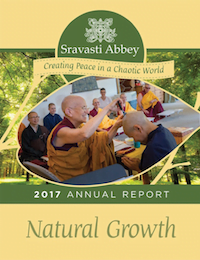 Rejoice with us in the growth of our monastic community and a year filled with rich Dharma activities. Read an abridged version of our Annual Report here. Ven. Changshen from Dharma Drum Mountain in Taiwan participated in Living Vinaya in the West and wrote a report for the Dharma Drum Mountain newsletter (with a great photo). Ven. 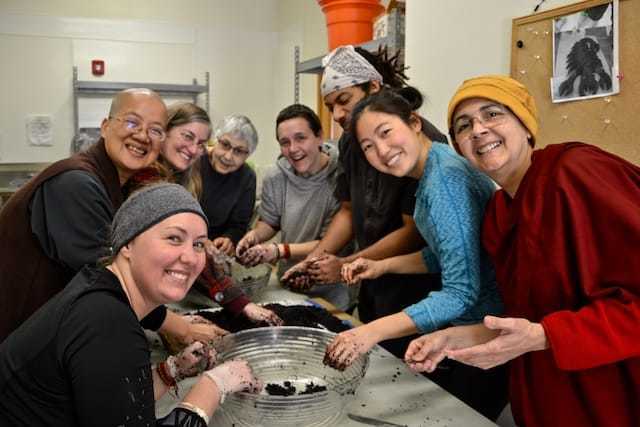 Chonyi’s article about the course appears in Northwest Dharma News. Dharma Drum Mountain’s Humanity Magazine published an interview with Ven. Chodron on her life and practice, which she gave while in Taiwan last year. Read it in English here and in Chinese here. Another installment of Luis’ series on love speaks of Creating Bonds. Read Ven. Tsepal’s article on living a good life with mental illness. Ken shares reflections on another birthday and the approach of death. Ven. Pende talks about taking full ordination in Taiwan.